Torrential rains submerge hundreds of houses in neck-high water and mud in Indonesia's easternmost province. Flash floods and mudslides triggered by days of torrential rains tore through mountainside villages inIndonesia‘s easternmost Papua province, killing at least 58 people, wounding scores and forcing more than 4,000 from their homes. Sutopo Purwo Nugroho, spokesman of the national disaster agency, told reporters on Sunday that 51 people were killed in the town of Sentani, where 74 others were injured. Heavy rain caused landslides in the nearby provincial capital of Jayapura, killing seven people there, Nugroho added, noting that number of dead and injured may increase since many affected areas had not been reached. #Update: Pictures of the Flash floods in #Indonesia‘s easternmost province #Papua that killed at least 42 people and left 21 badly injured. Sentani was the worst hit in the disaster, where a landslide early on Sunday was minutes later followed by the flooding of a river, sweeping away residents, heavy logs and debris, said Martono, the local disaster mitigation agency head. 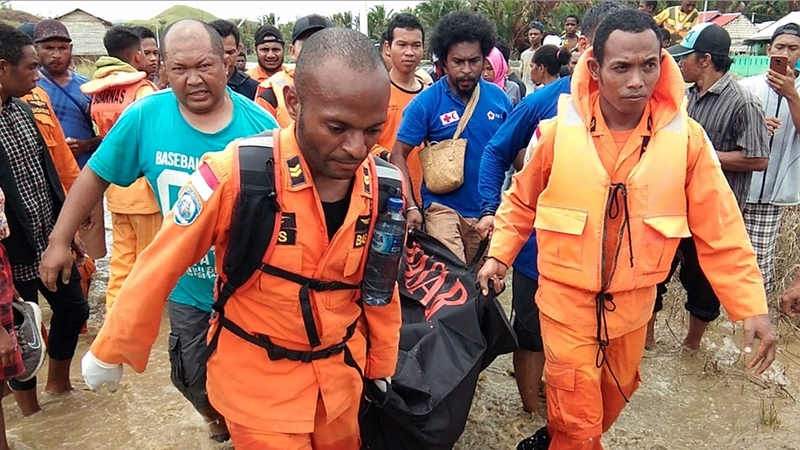 Colonel Muhammad Aidi, Papua military spokesperson, said rescuers managed to save two injured infants who had been trapped for more than six hours. The parents of one of the babies died. Martono said rescuers have been evacuating more than 4,000 people to temporary shelters. #UPDATE: Death toll in #Indonesia‘s flash floods rose to 63. Researchers are rushing to search and rescue dozens more after flash floods hit Jayapura district of Papua province in the country on Saturday night. In Doyo, a housing complex was littered with huge rocks believed to have rolled down from a nearby mountain, according to an AFP news agency reporter at the scene. “The rain started last night and went on until around 1:00 am this morning,” said Lilis Puji Hastuti, a 29-year-old mother of two young children in Sentani. “Our house was flooded with thick mud … we immediately grabbed our valuables and ran to a neighbour’s house to seek refuge. It’s hard to get out of the area because many roads are blocked … I’m worried, sad and scared all at one time,” she added.